Yang Jiang is 100 years old. Yang Jiang was born on July 17, 1911 in Beijing. No ceremonies for the birthday; for many years she has shied away from the media but is alert and loved by her readers. Born a few months before the Revolution of 1911, she went through the whole modern history of China and this (great …) grandmother of literature is also admired for the modern couple she formed for 63 years with one of the most outstanding Chinese scholars: Qian Zhongshu. She met Qian at Tsinghua University, fell in love, they married in 1935 and then spent three years at Oxford and the Sorbonne. 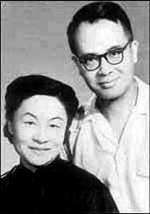 In 1937, their daughter Qian Yuan was born; she became an English teacher and Jiang was very proud of her (“the masterpiece of my life”), she died in 1997 one year before her father. Translator and playwrighter, her four plays have had success in the 1940s, one of them “Flowers blown away” is translated into English (1): a psychological analysis rather interesting but with limited dramatic developments and an outcome that does not convince. An idealistic young graduate married the daughter of a wealthy family and despite the opposition of the parents, they settled in a village and opened a school. They disturb the village and the arrogance of the hero leads to a plot that sends him to prison for one year. A friend, a lawyer, close to his wife, gets him out and he returns to the village. His wife is between the two men and cannot choose; no happy ending ! It is a psychological drama with no political content even if the attitude of the peasants, not convinced of the benefits of learning to read, does not classify this play as “progressive” literature of the time! Qian Zhongshu, meanwhile, published in 1947, one of China’s major novels of the 20th century, “Fortress Besieged” (2). The couple who decided to stay in China despite proposals from abroad, was persecuted during the Cultural Revolution and sent, separately, two years in Henan in ” May 7 Scools for executives.” They were reeducation institutions in the countryside, where millions of people stayed. The presence of these intellectuals did not improve life in the countryside or agricultural production and the farmers will have to feed these intellectuals unable to meet their own needs. “Six chapters from my life “downunder” (3) is published in Beijing in 1981 and recalls by its title “Six records of a floating life” (4), one of the finest pieces of Chinese literature. Yang Jiang’s book is little read in China, but is noticed in France and in the United States. These stories were followed by a series of anecdotes, “Dark Clouds” (5), the first two years of the Cultural Revolution, the humiliations: posters, accusations, self-criticism, cleaning the toilets, in short, the usual scenario but very well told. A much more ambitious novel is published in Hong Kong in 1988: “Baptism” (6) which takes place after the Revolution of 1949, during the first movement of ideological struggle (“TheThree Anti”), a satirical book about the hopes and fears of Chinese intellectuals who try to find their position in the new society. Hypocrisy and arrogance of the heroes that the author looks remotely, questioning at the same time the moral responsibility of intellectuals vis-a-vis the government. I confess that I was not captivated by the strategies of defense and attack of all these characters that I find somewhat annoying and rather schematic. For cons, I read with pleasure “Rambling memoirs” (6), published in Guandong in 1992. Angel Pino and Isabelle Rabut elegantly translated the first part of this collection of “prose” (sanwen): “Souvenirs mixed, various writings.” Casualness of the writer, discretion, truth of details, modesty, she delves into her past but remains a spectator. Popular in China, famous for her translations, including “Don Quixote”, she published an autobiography in June 2003: “The Three of us” was a huge success: the first edition of 30,000 is sold out in a few days, 5 million copies were sold in total. This book was started by her daughter, six years after her death, her mother writes to the memory of “We Three”. She becomes a cultural icon, an example of the traditional virtues of Chinese literature. She defends patriotic positions and stands as a vigorous guardian of the work of Qian Zhongshu. Again, a love story, a marriage of 63 years, this can be a dream … or a nightmare! In 2007, she published a collection of essays “Arriving at the borders of life, my answers to my questions.” The latter two books are not translated, but all her books sell well: for the last ten years, she gave her royalties and those of her husband to a foundation that has distributed scholarships for Tsinghua University amounting to one million euros. She still has projects: a sequel for “The Bath” and the publication of her studies of “A Dream of Red Mansions” … A special issue of the journal “Renditions” (University of Hong Kong), prepared by Christopher Rea ( Professor at the University of British Columbia) includes translations of a play and of some of the essays published in 2007 and should be published before the end of the year. (1) Edward M. Gunn, “Twentieth Century Chinese Drama.” Indiana University Press. 1983. (2) Qian Zhongshu: “Fortress Besieged”. Translated by Jeanne Kelly and Nathan K. Mao (1979) , Penguin Classics. (3) Yang Jiang: “Six Chapters from my life downunder.” Translated by Howard Goldblatt. University of Washington Press, 1984, 104 pages. (4) Shen Fu: “Six records of a floating life” , translated by Leonard Pratt and Chiang Su-Hui. Penguin Classics 2004. (5) Jiang Yang: ” Sombres nuées”. Translated into French by Angel Pino. Christian Bourgois editor. 1992. 90 pages. (6) Jiang Yang: “Baptism”. Translated by Judith Amory and Yaohua Shi. Hong Kong University Press; 2007; 304 pages. (7) Yang Jiang ” Mémoires décousus” Translated into French by Angel Pino and Isabelle Rabut. Christian Bourgois editor. 1997. 260 pages.